It’s a happy Monday everyone! 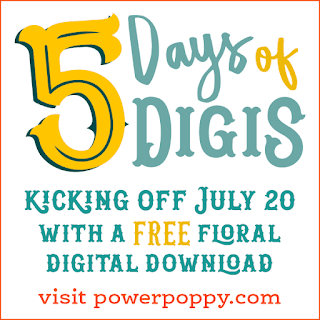 I’m determined to seize the day, so this brand new illustration from Marcy at Power Poppy is perfect for today! 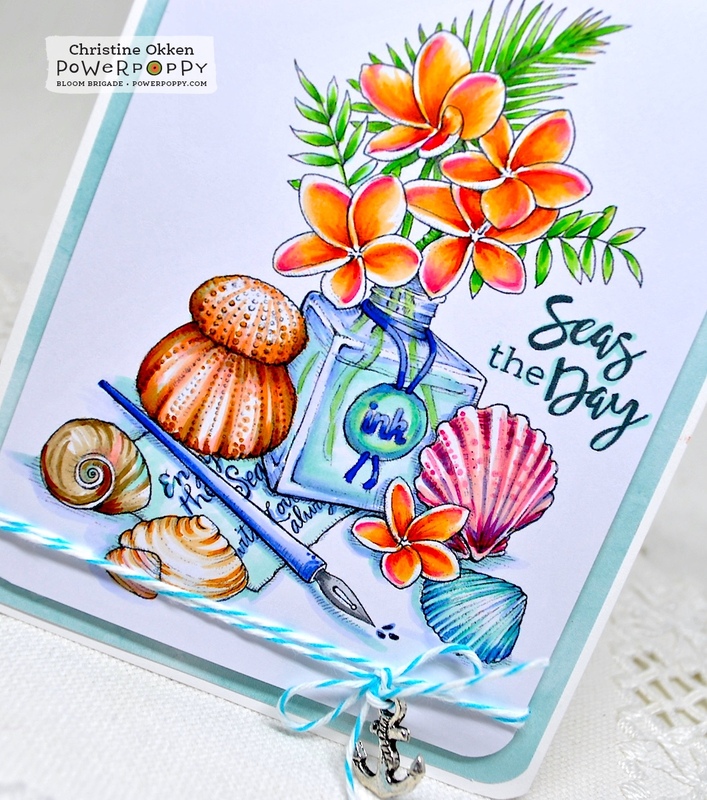 It’s called Seas the Day, and it combines beautiful seaside themes with some stunning plumeria tropicals and palms tucked into a vintage ink bottle. Perfect for a birthday, summer encouragement or that sweet note you want to send to someone from a seaside vista. I did a quick, clean and simple design where all that pretty illustration shines. I sized my digi to be almost a full card size so you could see all the pretty shells and details. I love how plumeria flower can be found in some unique colours and this hot pink to orange variety caught my eye. The whole scene is coloured up with Copics, placed on sheet of designer paper that has a watercolour feel to it. Finished off with a bit of baker’s twine and a pretty anchor charm to accent that seaside theme. 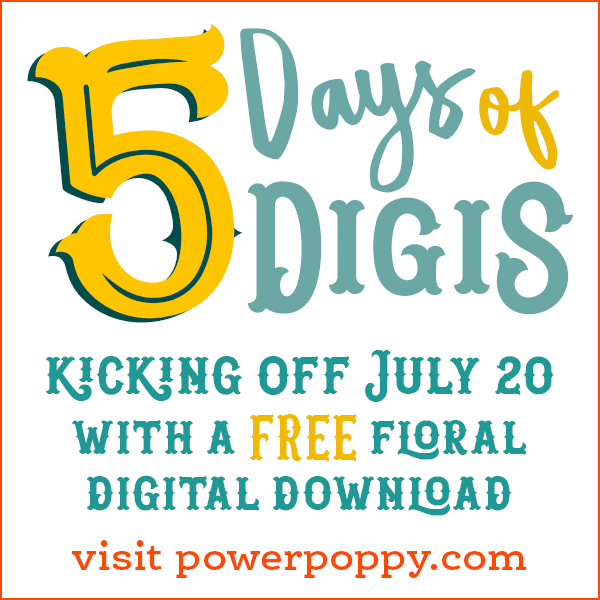 Just one more day of our 5 Days of Digis left! We hope you’ve enjoyed day 4! It was a joy to bring another amazing illustration to you! Nicely done Christine! I am so loving this one! I love your work! Thank you for sharing! 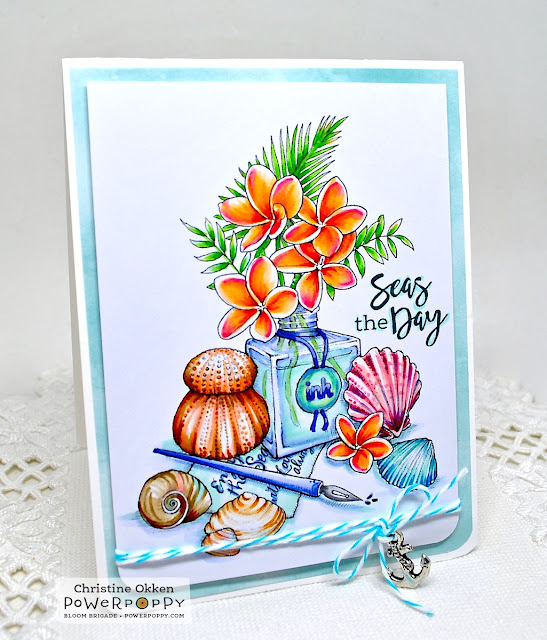 This is so beautiful, Christine! It's so soothing and I can almost feel the ocean spray! Your color palette is perfect. Wow! Your card is gorgeous Christine! I love the vibrant colours against your white background. The anchor is a nice finishing detail! Love this. I've been saving the 5 Days of Digis for last since we got home from vacation because I want to savor it. I feel some digi spending coming on. Oh, how I love this one! !